The Bud Sister’s™ Pain Relief Salve is made from all organic ingredients. Our topical Pain Relief Salve was created to help people who were in need of an organic and natural topical pain relief medicine. We have been involved with a natural lifestyle and the holistic healing properties of herbs for over 30 years. We always wanted to make something that was organic, simple and would benefit people’s health. After spending years taking classes, researching, working with scientists and experimentation we finally produced The Bud Sister’s™ all organic Pain Relief Salve. 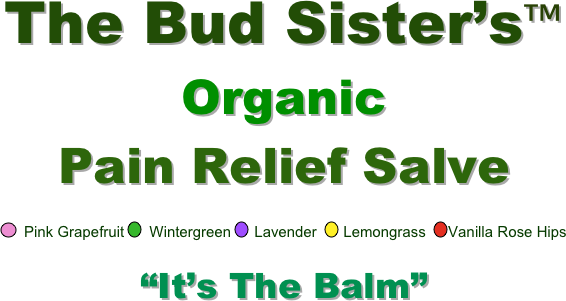 We are proud to say that The Bud Sister’s™ all organic Pain Relief Salve is simple. Just four ingredients are used in our formula. those found in the skin. This makes it an effective moisturizer and protectant for skin. is needed for soft, smooth skin. •The addition of our third ingredient, organic bee’s wax, has its own unique benefits. It adds healing, soothing and deep moisturizing properties to salves. Beeswax's anti-inflammatory, antibacterial, anti-allergenic, and germicidal antioxidant properties make it beneficial for wound healing. Propolis in bee’s wax displays strong antimicrobial activity and has been used as a chemotherapeutic agent since ancient times. It was used in folk medicine as early as 300 BC for medical and cosmetic purposes, and as an anti-inflammatory drug and wound-healing agent. More recently, it has been reported to possess antibacterial, antiviral, and anti-fungal properties. •The forth ingredient used is organic essential oils. Each essential oil contains its own medicinal qualities besides offering four distinctly different healing aromas. We produce Lavender, Lemongrass, Wintergreen, Pink Grapefruit and Vanilla Rose Hips pain relief salve. 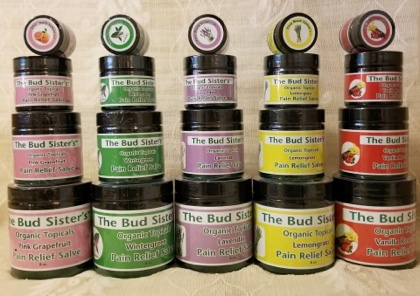 The Bud Sister’s™ all organic Pain Relief Salve provides pain relief for conditions ranging from migraines, arthritis, back pain, muscle spasms, burns, tension, relief from inflammation, muscle strain, bruising, insect bites, psoriasis, eczema, scarring and much more.